I would imagine that living in space is tough. It's dark, you are in cramped quarters and life can get pretty uncomfortable up there. Luckily, I don't think the Callisto family faces these issues in their Stellosphere! Not familiar with the Callisto family? They are Miles from Tomorrowland's family and they explore the galaxy from their big space station called the Stellosphere. Disney recently sent us Tomy's Stellopshere to review. My son Logan was thrilled when a giant box arrived at our front door a few days after returning from Walt Disney World. I have to admit I though the box might just be full of bulky packaging. When we opened the box I was pleasantly surprised to see that the Stellosphere is a nice, big size. Miles is included with the ship but you can purchase the rest of the family (Loretta, Phoebe and Leo) and Merc the robo-ostrich (Mechanical emotionally responsive creature) separately. Logan's favorite feature about the Stellosphere is that it transforms into 3 separate ships. The main ship acts as home base for the Callisto's and opens up to reveal a command center. The command center is spacious and has room for multiple action figures. The main ship may be slightly big for little hands to fly around the play room, but the Mini Starjetter is perfect for shorter trips in little hands. The Zip Ship was Logan's choice for longer missions to the outer limits (his bedroom). Each component opens up for Miles or one of the other action figures to comfortably sit inside and explore space. Not once over the course of an hour did I hear any complaints about pieces breaking off or needing to be adjusted. Not having to constantly be called to fix toy pieces is a big win for this mom! Another fun feature is that each ship lights up and makes sounds with the help of a moveable XVR system that attaches to each ship. Parents might have to help younger kids maneuver the system but it is worth it. The sounds and lights really make the ships come to life! I have seen many toys come through our apartment and many are flimsy, break easily and are not worth the price. The Stellosphere however is certainly well worth its price point ($29.99). Each smaller ship is sturdy in its own right. They each easily connect or fit into the main component. The main component is big, and holds all of the other ships, and accessories in a neat, good looking package. This is one toy I don't mind having around Logan's bedroom! The Callistos are on a mission to connect the universe. Explore the galaxy on the Stellosphere, the home base space station for the Callistos; where they relax, recharge, and receive new missions from the TTA. The Stellosphere comes apart into 3 separate ships to make space explorations easier. 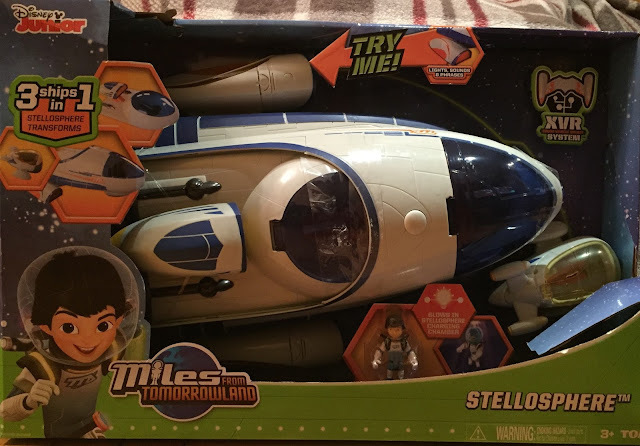 Open up the large Stellosphere plates to reveal the Castillo's command center where Miles and the Cllisto family (figures sold separately) can receive missions from the TTA. For short and quick missions, take the mini StarJetter that is stored in the Stellosphere. For longer missions over greater distances, take the Zip Ship, which can be removed from the top of the Stellosphere. To boost any ship in the line with lights and sounds, remove the XVR system from the bottom of the Stellosphere and attach to the other ships. With so many ways to explore, no mission is too difficult.